Edmond is a work by the French-British actor, writer and director Alexis Michalik, which premiered as a stage play in 2016. 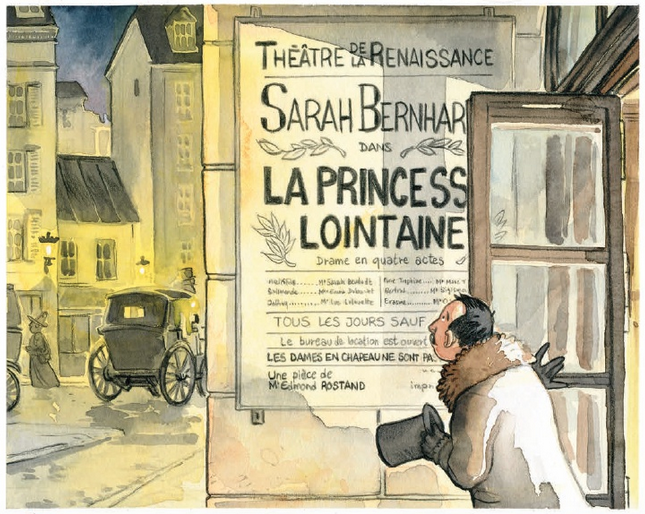 It concerns Rostand, of course, and recounts his rebound from the disaster of La Princesse Lointaine with the feverish creation of Cyrano de Bergerac. Edmond was nominated for seven Molieres, of which it won five. It then became a graphic novel illustrated by Léonard Chemineau, and was released as a feature film (directed by Michalik) in January 2019. Cyrano, needless to say, was Rostand’s high-water-mark; the Rudel connection obliges me to concentrate on the low-water-mark. Somehow, that suits the Rudel legend: PG Wodehouse used him as a comic peg, Angela Thirkell had some fun at his expense - and yes, there’s a bit of a stench of failure emanating from Jaufre’s story. If you’re waiting for a ‘But...’ I don’t really have one. 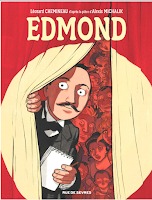 Rudel’s sad end - as emphasised in Edmond - is a kind of punchline, a low point from which Rostand must recover in order to fulfill his destiny. But the legend of Rudel remains, as a marker that writers and artists can’t help touching upon now and then. Oh look, I had a ‘But...’ after all. Nino Berrini (1880-1962) was an Italian journalist, playwright and director. His play Rambaldo di Vaqueiras (1921) ('poema drammatico cavalleresco', or 'a chivalric dramatic poem') is a fanciful take on the titular troubadour poet, who falls in love with his patron's daughter Beatrice. It is said to owe much to Edmond Rostand's work, in particular his Rudel play, La Princesse Lointaine (of which plenty elsewhere on this blog) - for example, Berrini's Rambaldo is mortally wounded and dies in Beatrice's arms. If your Italian is up to it, you can compare and contrast at the Internet Archive, which has the full text of Rambaldo di Vaqueiras. Berrini's obscurity these days may simply be down to the mediocrity of his work or to the whims of posterity; but it might have been assisted by the story of an incident during World War Two that, if true (or even if not), can't have done much for his reputation. While living in the Piedmont town of Boves, Berrini became caught up in an operation by the German SS to burn the town to the ground. A terrified Berrini scoured his library for a German newspaper cutting that quoted Hitler's appreciation of the writer's work, and took the article to show to the SS commander. Berrini's house was saved, but the other townfolk never forgave him. That, at least, is the story told on Berrini's Italian wikipedia page. Another treatment of the Rudel legend has popped up on Amazon. 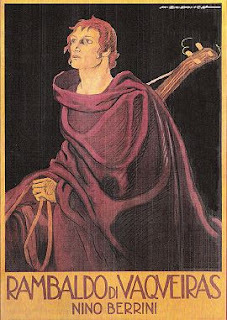 La Légende de Geoffroy Rudel, Prince de Blaye by Fernande Bourdeau Lhérisson was first published in 1933 by Société des Bibliophiles de Guyenne. 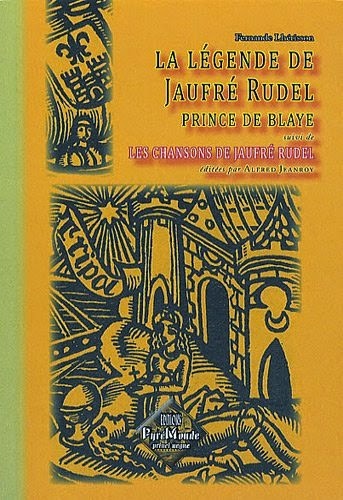 This slim volume also includes Alfred Jeanroy’s edition of the surviving Rudel songs. There's very little info on the author: the only other traceable work by Lhérisson is a book about the convicted murderess Marie Lafarge. It seems that Rostand's reach extended to the animal kingdom: according to the Pedigree Online Thoroughbred Database, there have been four thoroughbred horses named 'Princesse Lointaine'. The first is recorded in 1902 (which makes sense given the date of the Rostand production); others in 1941 and 1963, with a fourth sometime around 1954. Here's another indication of how Rostand's La Princesse Lointaine spread the Rudel legend more widely by influencing the visual arts. 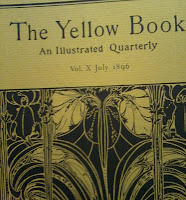 Besides the work by Mucha, Erté, and Vrubel, there were also illustrations by a famous-ish English artist. 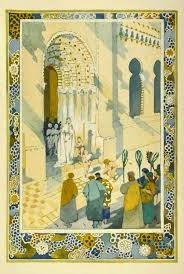 George Sheringham (1884-1937) was best known as a stage designer, but he also illustrated books by the likes of Max Beerbohm, Arthur Conan Doyle, Cyrus MacMillan, and - it so happens - Edmond Rostand. 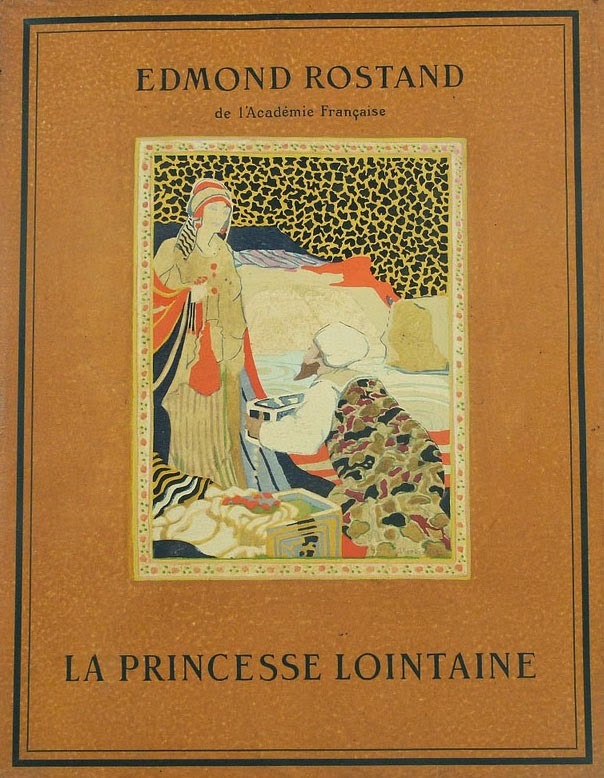 This edition of La Princesse Lointaine was published in 1919 and featured 26 illustrations by Sheringham. It was a limited run of 100 copies and was printed by J. Meynial, 'Aux dépens d'un Amateur' named Eugène Renevey. Sheringham was evidently well qualified to take on the Rudel legend: he spent the final five years of his life as an invalid, though not from pining for an idealised woman, lointaine or otherwise. 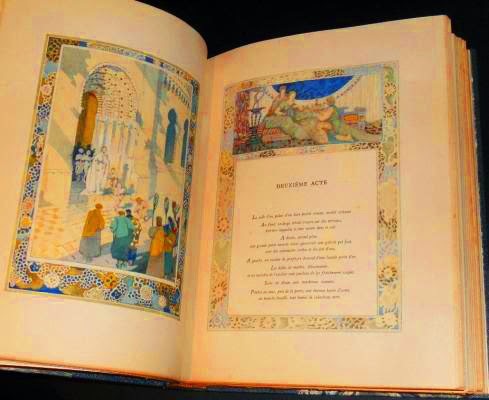 The edition sometimes comes up on rare book websites (from where I sourced most of the pics). Mikhail Aleksandrovich Vrubel (1856-1920) was a Russian Symbolist painter whose struggles with tertiary syphilis probably sealed his reputation as a purveyor of feverish, sometimes demonic visions. In 1896, Vrubel was commissioned to design a mural for a pavilion in the 1896 Nizhny Novgorod exhibition. He submitted two designs: the one that interests us here was a scene inspired by Rostand’s La Princesse Lointaine (known in Russia as Princess Gryoza, or The Princess of the Dream). The exhibition panel rejected both murals, but they were later completed by other artists under Vrubel’s guidance. It was presumably this picture - a 53-by-23-foot canvas painted in oils - that was discovered in a Bolshoi Theatre warehouse in 1960 and, after restoration, formed one of the centrepieces of the reopened State Tretyakov Gallery in 1995. The ship seems to be soaring over the waves. In the centre is the dying prince, a lyre in his hand. Standing by the ship's mast is his friend, knight and poet Bertrand. To the right are pirates, moved by the intensity of the prince's love; What they have witnessed will subsequently turn them into crusaders, knights of the spirit. In the last moments of his life, the hero sings a song about his reverie, princess Melisande. The entire world – Nature's elements and people's souls alike - are caught by the sounds of lofty music. At this instant, beauty triumphs in the world and a miracle takes place: the ravishing princess bends over the poet's brow. The painting personified the idea of art's timelessness, its spiritual power over the temporal world. In 1905, Vrubel returned to his treatment of the Rudel legend when he created mosaics for the hotel Metropol in Moscow. One facade features a mosaic panel also entitled 'Princess Gryoza'. It’s still there, and often shows up on Flickr. The following year, Vrubel’s long struggle with tertiary syphilis left him almost blind and mentally unable to continue painting, and he died in 1910. But we don’t expect happy endings where Rudel is concerned. 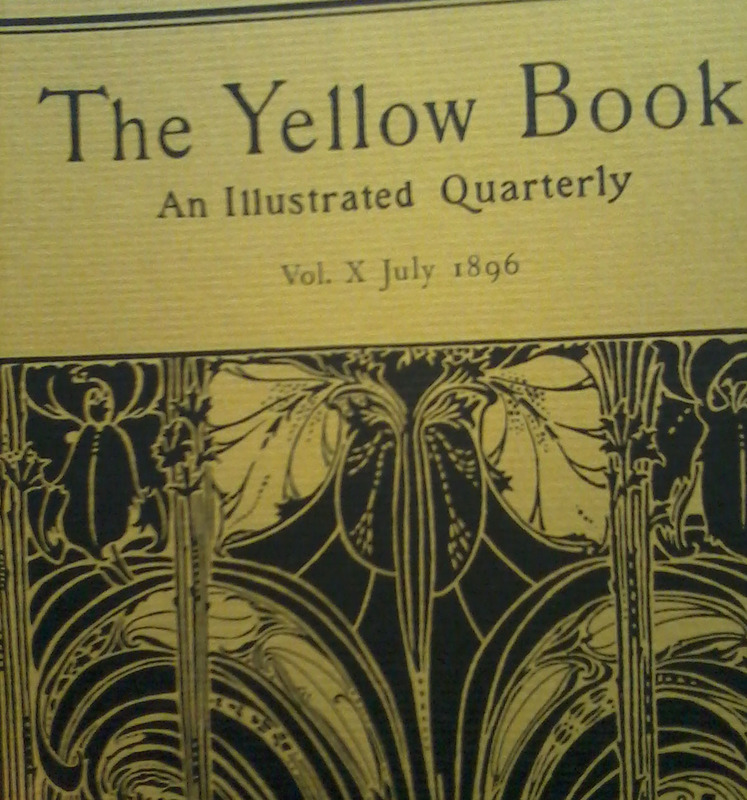 Rooting about in the University of Bristol's Theatre Collection recently, I happened across some issues of The Yellow Book - the short-lived (1894-1897) but notorious literary journal. I'd wondered whether I might find mention of Rostand or Bernhardt, this being the era of La Princesse Lointaine, but no. What did jump out at me was a poem by Rosamund Marriott Watson from the July 1896 issue. No, not the greatest thing ever written, but it has Rudel stamped all the way through it. The line 'As once in May' is a pretty spot-on echo of Jaufré's 'Lanquan il jorn son lonc en mai', and the blackbird / dead leaves imagery is standard troubadour schtick. It could also pass for a monologue by the dead Rudel. 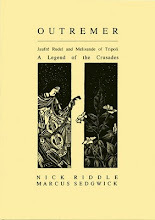 Not mention the similarity of the title to a certain book concerning Jaufré Rudel. No doubt this is one of thousands of Provençal knock-offs from the Victorian era, but its publication in the Bible of the Decadents is kind of interesting.